This is the story of God calling me to follow him no matter where he goes. I call it "Wet Soul, Dry Ankles" referencing my call to walk on water as the Apostle Peter did. My soul is wet from the Word of God, and my Ankles Dry from walking above the water in faith. we usually worship the wrong things. I have been sensing that God wants us to worship together. This is looking beyond church walls and denominations. I look around and see churches competing with each other. When I was a pastor, one of the biggest questions that other pastors asked was, "how many people do you have?" That was annoying to me. I understand people want to know how you are doing, but I felt like the reason people asked was because it was always about numbers. I don't think we were meant to be so segregated. We have separate churches to lead people to Christ in our own area, but the Spirit of God is in each church. Let us come together and Worship the One Spirit. 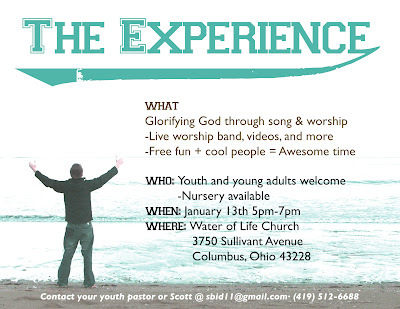 The Experience, is a chance for churches to get together to Worship God corporately. As one. Jeff Stuttler, a gifted guitarist and singer, will be leading us into the presence of God. He has spent time in Kansas City and Nashville studying both to lead worship, and to listen to the voice of God. Please join us in this adventure. Tauni and I were putting the kids to bed this evening and some angels showed up at the door. I say angels, or God's messengers, without really knowing who or "what" stopped by. But as I went down to answer the door after someone knocked on it, There was no one there. I looked down and there were 3 boxes of stuff. I looked around for just a hint of movement or tail lights, but saw nothing. In these boxes were things that we needed, and or were secretly desiring. I had just mentioned to Tauni that we needed to go get toilet paper. Low and behold, it showed up on our door step. I have really been wanting some meat for sandwiches during the day lately, and haven't been able to buy any. In the second picture, there is a large ham. We had run out of fruit and we recieved that as well. It is really funny because our apartment complex gives us Panera bread each week, and yet I have been wanting regular bread to make a peanut butter sandwich. We are very appreciative for everything that we got, and wanted to share about just a few things that stick out. All this to say, GOD IS GOOD. I was just looking in the refrigerator tonight and thinking, "how am I going to feed my family?" God has now answered. This is a large file, so it may take a while to load. You can also right click on it and save it to your desktop, it might be faster that way. You can fill in this form and when a new blog is written, it will send you an email. I host my video files on blip.tv. You can download and embed these videos on your site from here. You can also subscribe to it here on iTunes or other such rss feed readers. This is not here for you to feel guilty and make you feel like you have to donate. God has called me to follow him and go where he wants me to go. This has come at a price for my family and I. This blog and all the video devotions are free of charge to download and to use anywhere and anyone can use them, I just ask that you give me credit and a possible link back to this page. This button is here just in case God is laying it on your heart to give. I am not relying on people to supply my needs, but God alone.